10. Poets Forum is queer. With three queer chancellors (Mark Doty, Marilyn Hacker, and Carl Phillips) and a lesbian Executive Director , the Academy has a great record of honoring the long tradition of the queer poet. Also on panels or leading tours this year are Mark Bibbins, Randall Mann, Dante Micheaux, Brenda Shaughnessy, and Stacy Szymaszek. 8. Poets are friendly. 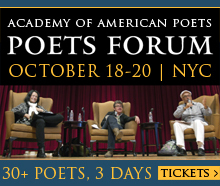 Like any gathering where the likeminded come together to celebrate literature, Poets Forum offers a great opportunity to reconnect with friends (Facebook or otherwise) and make new ones. 7. Mark Doty wants you to. 6. To whet your appetite, a free download of the Chancellors reading at the inaugural Poets Forum. 5. Elizabeth Alexander will be speaking on Lucille Clifton. I can’t wait! With Clifton’s collected poems newly available, Alexander’s insight into her work is sure to offer an equally fresh perspective. 4. Plus, Marilyn Hacker and Sharon Olds on “The Poetry and Legacy of Adrienne Rich.” Who better to remember the iconic lesbian poet, who passed away earlier this year? 3. 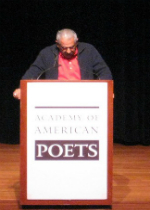 Speaking of Sharon Olds…her explanation of line in this video from last year’s Forum. You simply must watch, because nothing I could write could do her justice. 2. It’s inspiring. Forgive me for sounding saccharine–but it’s true. Each year the panels, lectures, and readings at Poets Forum surprise me, make me think in new ways, and get me writing (always a welcome gift). 1. The Chancellors Reading is one of the best readings of the year. On October 18, you have the chance to hear fifteen of the most esteemed, groundbreaking, and beloved poets in the country read their work together on a single stage. Even–and especially–if you don’t make it to many readings, this is one you should be sure not to miss. Click here to find out more about all the events offered this year here, and here to buy tickets.